TRAP DESCRIPTION: This trap is our "Original" Hog Trap. It's designed to act as a repeating trap. In other words, you can catch several hogs at one time with it. If you place enough bait in it so that the first hog that enters can't quickly eat it all, others will surely follow it inside. And once inside, they can't escape. It's large entrance and height insures most wild pigs will enter. Only the biggest hogs, those in excess of several hundred pounds, might not be able to fit. 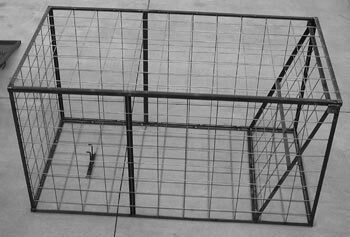 Since most nuisance animals will be in the 150 lb and under range, this trap will work on most all hogs. Keep in mind it has trapped hogs over 300 lbs and one over 400 lbs!!! Made with 1 1/4" Angle Iron, it's built hog tough. Galvanized livestock panel wire is mig welded to the angle iron and is hog tested so we know it won't give way – even to the meanest pig! 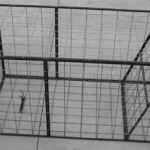 The trap is fully enclosed, from the top to the bottom, so there is no chance of the hog rolling the cage and escaping. Four two foot long "T" handles are included and should be used as ground stakes. This will help keep the trap anchored. Even though it weighs around 100 lbs, mad hogs can rock it and move it once trapped. Use these ground stakes to minimize any such movement. This trap will function as a true repeater type trap. RECOMMENDED BAIT: Corn. Though 25 lbs would be enough for most sets, using 30-40 lbs is a better idea – especially if you have more then one pig you want to trap.